Shark Week Bonaire – Tons of Fun for Everyone! Join STINAPA for a week filled with shark fun from Saturday June 9th till Saturday June 16th. STINAPA, along with the other Dutch Caribbean islands and the Netherlands, is inviting the community to celebrate Shark Week. 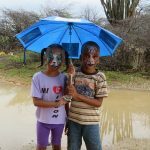 The Save Our Sharks project is an initiative of the Dutch Caribbean Nature Alliance and is made possible by the ‘Nationale Postcode Loterij’. Due to intense overfishing, shark populations throughout the world are in trouble. 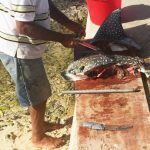 The Save Our Sharks campaign on Bonaire is focused on creating awareness in the Bonairean community, working with fishermen and conducting research on sharks. Saturday June 9th from 9 am to 12 pm at Lagun – World Oceans day! Coastal clean up with potluck picnic. 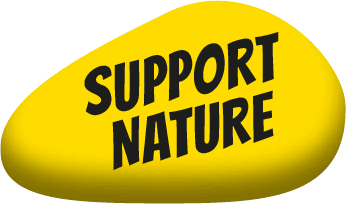 Saturday June 9th – Premiere ‘ Save Our Sharks Bonaire Movie’ at NosTv & Energia. Monday June 11th till Friday June 15th from 9 am to 12 pm at the Washington Slagbaai National Park – Shark Ambassador Primary School Program. 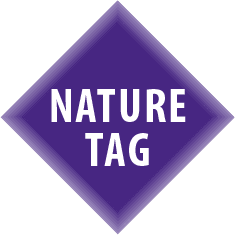 Tuesday June 12th and Wednesday June 13th from 3 to 4 pm at DCNA – Presentation about sharks and the coral reef, as part of the Junior Ranger Program. 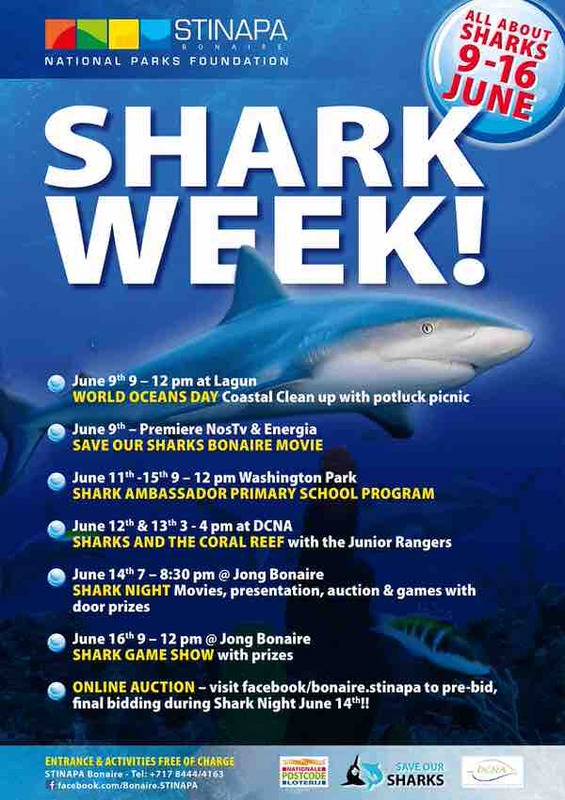 Satuday June 16th from 9 am to 12 pm at Jong Bonaire – Shark Game show with prizes, together with the Junior Rangers. Online Shark Art Auction – Visit facebook/bonaire.stinapa to pre-bid. The proceeds from this auction will go towards shark conservation in the waters of Bonaire. Final bidding during Shark Night June 14th! STINAPA invites the entire Bonaire community to join the activities during this week. The Shark Week activities are open to the public and free of charge.